Concern about misinformation — which can be defined as stories that are made up or cannot be verified as accurate but are presented to readers as if they are accurate — is not confined to one political party. 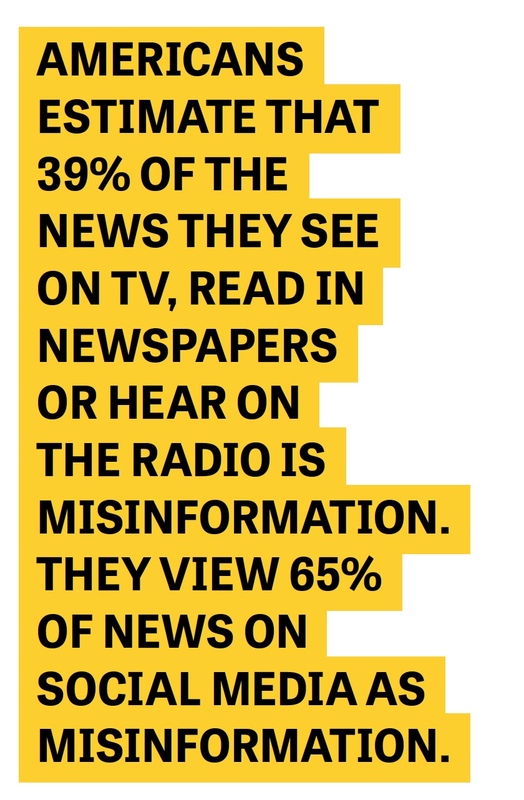 Overall, Americans believe 39% of the news they see on television, read in newspapers or hear on the radio is misinformation. They estimate that nearly two-thirds of the news they see on social media is misinformation. More than three-quarters of U.S. adults (76%) say major internet companies have an obligation to identify misinformation that appears on their platforms. A slim majority say identifying misinformation is one of their most important responsibilities. Seventy percent or more of the public believes that methods to counteract the spread of misinformation, such as giving greater prominence to stories from reputable news sources, showing readers ratings of a news organization’s trustworthiness and providing links to additional stories on the topic, can be at least somewhat effective. The extent to which Americans perceive misinformation in the news environment and their belief in the effectiveness of methods to counteract it are influenced to a large degree by their political leanings and their opinions of the news media more broadly. These results underscore how a lack of trust in the news media intertwines with perceptions of misinformation. Although Americans continue to see the media as playing a critical role in informing citizens in our democracy, the ability of the institution to effectively fulfill that responsibility is hampered when citizens are not confident that the information they receive is accurate. Gallup and Knight Foundation acknowledge support for this research from the Ford Foundation, the Bill & Melinda Gates Foundation, and the Open Society Foundations.